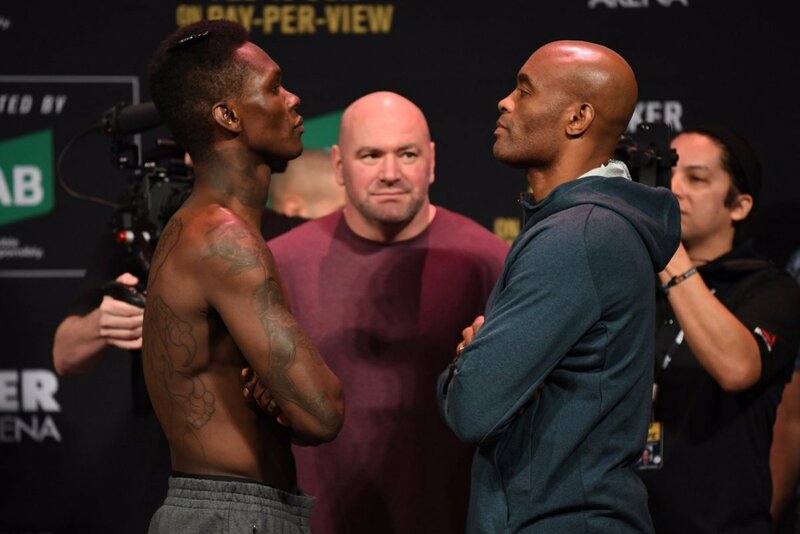 Welcome to F4WOnline.com's live coverage of UFC 234: Adesanya vs. Silva, which is emanating from the Rod Laver Arena in Melbourne, Australia. The UFC heads back to Melbourne for their first pay-per-view event of 2019, and the first of the ESPN era with prelims airing on ESPN, with an event that has been marred by chaos on fight day. This event was supposed to be headlined by UFC Middleweight Champion Robert Whittaker defending against Kelvin Gastelum in the main event. However, Whittaker has been forced out of the fight on the day of the event due to a hernia and emergency surgery, causing a huge shift in the fight card. Gastelum has been pulled from the event, and now a middleweight bout between Israel Adesanya and former UFC Middleweight Champion and one of the greatest of all-time, Anderson Silva, has been put into the main event slot. Due to the late change, it will remain as a three-round fight. Also on the main card is a bantamweight battle between Rani Yahya, winner of three straight, and Ricky Simon, who has won seven straight, and a light heavyweight battle between undefeated Jimmy Crute and fan favorite Sam Alvey, who fights on a numbered UFC event for the first time in his 17th UFC bout. The prelims will air on ESPN headlined by an exciting lightweight battle between Devonte Smith and Dong Hyun Ma. Follow along with our live coverage of the event beginning at 7 PM eastern time with preliminary action all the way thru the main card. Martinez right away with some kicks. They trade kicks. Martinez throwing high kicks. Buren with a combo ending with a kick and he shoots for a takedown and finishes it after an inside trip. Buren looking for a guillotine from the half-guard but Martinez defends as he gets to his feet but Buren still has the neck. Martinez defending from the side mount as he escapes and takes the back of Buren. Martinez throws some elbows from the back control. They scramble to their feet and Martinez lands some knees and a big left hand. Martinez lands a knee as they break. They trade kicks and Martinez slips to the mat. Buren goes into his guard. Martinez with an elbow from the bottom. Buren with a hammerfists and more punches at the end. Close round. 10-9 Martinez. Martinez right away with a leg kick. Buren with a step-in knee and follows with a kick to the body. Martinez comes back with a body kick. Martinez with a leg kick. Buren lands a left hand. Martinez landing some kicks. Buren shot for a takedown, Martinez grabbed the neck to defend, but Buren completed the takedown and is working in the half-guard. Martinez reveresed to the top but Buren swept from the bottom and got back to the top. They are working to stay on the mat. Martinez gives up his back but they scramble to their feet. Martinez grabs the back of Buren. Martinez looking for a choke against the fence. Martinez with a hard knee to the back and then another. Buren defended well at the end. 10-9 Martinez, 20-18 Martinez. They trade and Buren grabs the body and gets a trip takedown straight into mount. Buren grabbed the arm and had an armbar locked in deep but Martinez able to scramble out and gets the back of Buren and is landing big punches. Martinez got both hooks in against the fence. Martinez gets the mount for a moment but Buren gives his back up. Martinez looking to get his arm under the chin but Buren gives up mount and then his back again. Martinez with some big punches from the back. Buren able to scramble to the guard of Martinez. Martinez looked for a kimura for a second. Buren with a right hand but Martinez pushes him off. Buren goes back down and grabs the neck and works for an anacond choke. He loses it and they scramble. Martinez has the neck and goes to the guard of Buren and lands some punches. Should be a win for Martinez here. 10-9 Martinez, 30-27 Martinez. Potter with a leg kick and goes right for a takedown but pulls guard. Turner escapes back to his feet. Turner lands some right hands and then drops him after a left hook and a body kick and then finishes him off with some punches on top. Impressive win by Turner as he showed some quick hands there. It went less than a minute. They trade kick attempts to start. Kang lands a right hand. They trade kicks. Ishihara lands a right hand and follows with a left. Kang hurts Ishihara with a right and rushes in and Ishihara rocks Kang with a right hand. Kang recovers. Kang lands a right and follows with a knee. Kang with another right hand. Kang lands a knee that drops Ishihara to one knee. He gets up and Kang lands more big right hands. Kang with big uppercuts in the clinch. They are just throwing back-and-forth. Kang is landing bigger. They are swinging. Kang gets a takedown and takes the back. He's too high on the back. Kang has hooks in and has the choke but Ishihara grabs the fence. Kang gets the choke in deeper and Ishihara goes out cold! Wow. What a great one-round fight as Kang gets the win. They trade leg kicks. Kara-France rocked Paiva with an overhand right. Paiva went to his knees for a second. Kara-France with another right hand. Paiva shoots for a takedown against the fence after eating some right hands. Kara-France defends and they get back to the center. Kara-France lands an uppercut followed by a left hook. Paiva with a high kick. They trade punches. Paiva with a leg kick. Paiva lands a right hand and goes for a takedown but Kara-France scrambles away. Paiva lands a combo. Paiva with a high kick. 10-9 Kara-France. Kara-France goes for a takedown but Paiva defends and ends up on top. Paiva passes to side control. Paiva with some punches from the top. Kara-France scrambles to his feet and lands a right hand on the break and then he lands another. They break to the center and both are landing. Kara-France has slowed his boxing. Paiva lands and then lands a knee to the body. Kara-France tries another takedown but Paiva defends and is on top and lands. Paiva stands and lands punches on a downed Kara-France who was throwing upkicks. Kara-France lands a hard right hand after he stands. Paiva lands an uppercut. Paiva with a right hand. Kara-France lands the jab but Paiva is landing leg kicks. They trade in close range. They both land right hands. Kara-France with a right hand. Paiva lands a right hand and tries a late guillotine but time ran out. 10-9 Paiva, 19-19. Kara-France with some short leg kicks. They trade punches in close range. Paiva landing some combos. Kara-France lands a right hand. Paiva with a combo. They trade. Kara-France with a leg kick and Paiva lands a big kick right to the cup and we have a timeout. We get back to action and both men are throwing hard punches in the pocket. Paiva lands a right hand. Paiva is landing combos and hurts Kara-France for a moment. Paiva grabs the neck and it allows Kara-France to get a takedown. They get back to their feet. Kara-France lands a right hand. Kara-France lands another. They are trading in the pocket. Kara-France lands a left hook. Paiva counters with a combo. Kara-France is landing harder while Paiva is landing with more volume. Kara-France gets a late takedown. Close fight. 10-9 Kara-France, 29-28 Kara-France. Young looking to land the jab early. Young landing the combos in close range. Arnett is eating them well. Arnett lands a left hand in close range. Young with a leg kick. Arnett with a left hand. Young lands a short right hand. Young with a leg kick as he looks to get inside the reach of Arnett, who lands two left hands. Arnett constantly switching stances. Arnett lands the jab. Arnett is just landing with more volume. Young can't get inside the reach. Arnett with a body kick. Young with a body kick in return. Young lands a big combo late that hurts Arnett. 10-9 Young. Young with a body kick. Young with a leg kick. He is still trying to get in the reach of Arnett. Young with a body kick. Arnett with the jab. Arnett lands a left hand but he isn't following up on them. Arnett lands another left. Young is eating them well. Young with a left but Arnett counters with a right. Young with a right hand. Young with a body kick. Arnett with the double jab. Arnett with a right hand and Young fires back with some punches. Young with a body kick. Young with a right hand. Young landing some big punches late here. Arnett retreating around the Octagon. Young with a combo and tries a takedown attempt but lets go. Arnett lands a left on the break. Young fires back with a right hand. They trade late. Flurry to end the round. 10-9 Young, 20-18 Young. They are trading to start the third. Arnett trying the double jab but Young firing back. Arnett lands a right hand as he grabs the leg of Young. Young with a combo and lands a right hand. Young with a leg kick. They are trading in close range. Young with a combo as Arnett was backing up. Young with another combo. Arnett with the double jab. They are trading. Arnett with a high kick. Young is landing with more volume and lands an uppercut. Young coming on strong late. Arnett lands a right hand. Young with a leg kick. Arnett with a hook and then an elbow. They throw down late and Young drops Arnett right at the end. Wild finish. 10-9 Young, 30-27 Young. Smith landing early. Smith with some leg kicks. Ma is unable to get anything going on his feet in the first two minutes. Smith back with some more calf kicks. Ma starting to throw now but not landing. Smith with a right hand. Smith now landing some combos and hurts Ma. Smith drops Ma with a right hand. More big right hands on the ground from Smith and Herb Dean stops the fight. Wow. Violent finish from Smith. He has tons of potential at 155 pounds. Crute with a leg kick. They trade punches. Crute with a high kick but blocked by Alvey. Crute just misses a high kick but lands a leg kick. Crute with a body kick. Alvey lands a left hand. Crute then drops Alvey with a right hand. Crute tried to walk off but the fight wasn't stopped. Alvey recovered and got to his feet but Alvey hurt him again and Alvey was on the mat and Crute lands a lot of punches and the fight was stopped. Alvey is very upset at Marc Goddard about the stoppage and complaining a lot but Alvey wasn't defending himself well and the stoppage was good. De La Rosa landing right away as they get to the fence. De La Rosa gets Kassem to the mat and goes into her guard. De La Rosa with some punches from the top. Kassem remains on the bottom and looking to throw her legs up. De La Rosa works in the guard. De La Rosa continues to land punches from the top. De La Rosa still landing. Kassem keeping her in her half-guard but not attacking. De La Rosa looking for an armbar and then kimura late but time runs out. 10-8 De La Rosa. De La Rosa with a combo as she backs Kassem up against the fence and then scores a takedown. De La Rosa gets to side control and lands some punches and elbows. Kassem has no answer for having her back on the mat. De La Rosa gets to the mount and has a triangle locked in and lands elbows. De La Roa transitions to the armbar but Kassem trying to roll out. It is in deep but Kassem not tapping. Kassem gets out of it but still in the triangle. De La Rosa with a mounted triangle and landing elbows. She goes for the armbar again and Kassem taps! Big finish by De La Rosa. Yahya with a high kick and Simon counters with a left hand. They trade and Simon lands a big uppercut. Simon coming forward. Yahya with a combo. Yahya with the jab but eats a counter right from Simon. Yahya shoots Simon stands clear. Yahya with a body kick and hurts Simon with a right but Simon drops Yahya with a right hand. Simon goes to the mat for a moment but they get back to the feet. Yahya gets dropped again by Simon but gets up. Yahya lands a right hand but is still hurt. Simon showing great fight IQ by not going to the ground with Yahya. Simon gets a takedown off a timed-right hand from Yahya. Yahya wants Simon on the ground but Simon having none of it. Simon with a head kick. 10-9 Simon. Yahya with a leg kick. Yahya with a front kick and then lands a right hand. Simon lands a right hand. They continue to trade and Simon has a cut over his right eye. Yahya shot for a takedown but Simon defends. Simon gets a brief takedown and Yahya gets up. They trade right hands. Yahya hurts Simon with a right hand. Simon sprinting around the Octagon. Yahya chasing him down. Yahya lands two more right hands and then a left hook. Simon drops Yahya with a shoulder bump. Yahya gets back up. Simon with a takedown and he goes to the mat with Yahya. Yahya landed an illegal kick but didn't get called by the ref. 10-9 Simon, 20-18 Simon. Yahya with a high kick and is able to pull guard. Yahya tries for a triangle but Simon escapes to his feet. Yahya gets up. Yahya with a high kick. Yahya stuns Simon with a punch. The strikes are close. Yahya with a high kick and Simon counters with a right. Yahya tries hard for a takedown but Simon sprawls away. Both men are cut open and it was a headbutt that cut Yahya open. Yahya shoots again but can't complete it. Yahya with a high kick but Simon counters with punches and Yahya is eating a lot of damage. Simon with the jab. Simon gets a takedown and in the guard of Yahya. Simon rides it out on top. 10-9 Simon, 30-27 Simon. Mariano with a high kick. Vannata misses a right hand. Mariano with another high kick and then they trade leg kicks. Vannata gets a body lock and scores an easy takedown. Vannata in the half-guard. Vannata with some elbows from the top. Vannata gets inside the closed guard of Mariano. Vannata with more punches from the top. Mariano doesn't have an answer from the bottom. Vannata with more and more punches and elbows from the top. Vannata clearly the superior fighter. Vannata with more ground strikes as he postures up. Vannata grabs the arm for a kimura and he gets Mariano to submit with seconds left in the round. Easy work for Vannata. Both looking for openings inside the first minute. Neither seem to want to take a huge risk. Adesanya lands a leg kick. Silva counters with his own. Adesanya tries a hook kick but Silva grabbed the leg. Adesanya tries a kick but misses and Silva chases him. Adesanya hurts Silva with a right hand. Adesanya lands an elbow and a knee. Silva holding his hands low. Adesanya with an inside leg kick. Silva chases Adesanya around. They trade body kicks. Silva lands a right hand. Adesanya lands a right hand. Adesanya with a leg kick. Adesanya lands a left but just barely misses a head kick. Silva misses a spin kick. Adesanya lands a left hand. Adesanya with a taunt at the end. 10-9 Adesanya. Silva just misses a hook kick but the heel did land. Silva with a right hook. Adesanya with a leg kick. Silva with a body kick. Adesanya with a body kick. Adesanya with a combo and Silva eats it. Adesanya misses a head kick and Silva lands a counter right hand. Silva lands a combo and they clinch and Silva lands on the break. Adesanya with a leg kick. Adesanya with a low kick. Silva lands the jab and then another. They clinch and Silva with a body punch. Adesanya with a leg kick. Silva with a leg kick and then lands a left hand. Silva chases Adesanya around the cage and lands an uppercut and body kick. 10-9 Adesanya, 20-18 Adesanya. Adesanya with a leg kick and it hurt Silva. Adesanya tries a kick and Silva grabs it and Adesanya goes down for a moment and Silva misses a huge flying knee. Silva has his back against the fence. Silva telling Adesanya to come after him. Silva with a side kick. Silva's right eye is closing from what may have been an eye poke. Adesanya with a leg kick and then another. Silva with a leg kick. Adesanya lands a left hand. Silva with a body kick. They trade left hands. Adesanya with a high kick followed by a right hand. Silva lands a right hand. They both miss spinning attacks. Really wish this was five rounds. Fun fight. 10-9 Adesanya, 30-27 Adesanya.